55-3248 serving in Viet Nam. • 55-3248 United States Army. Delivered 21Jan-1956. Sharpe Army Depot, Stockton, California for overhaul and was assigned to Intelligence & Security Command. November '68 joined the 21st Signal Group, moving in March 1969 to the 2nd Signal Group to Vietnam. Put into storage with the 608th Transportation Company, Dong Ba Thin, Vietnam. July 1969 with the 79th Transportation Company at Qui Nhon Vietnam. Outside storage at Army Depot at Atlanta, GA., in October 1969 until May 1972, when it was put up for disposal as military surplus. • CF-BER Air Craftsmen Ltd., St.John, NB. To restore to civil configuration. Oct / Nov-1972. • CF-BER Dolbeau Air Service Inc., Chibougamau, QC. Circa 1974. • CF-BER Direquair Inc., Chibougamau, QC. Circa 1975. Accident: Chibougamau, 18-Feb-1975 Report states - Final approach; controlled collision with the ground; substantial damage. • CF-BER A. Fecteau Transport Aérien (later Air Fecteau Ltée), Senneterre, QC. Circa 1976. • CF-BER Propair Inc., Senneterre, QC. Canx 29-Jul-1985. Re-named from A. Fecteau. Incident: Natashquan, Quebec on 24-Feb-1986. While in the cruise, engine vibration was experienced and the aircraft made a precautionary landing on a bay. • C-FBER Pickle Lake Air Services, Pickle Lake, ON. Regd Jul-1985. Canx 17-May-1988. Accident: Unknown location ON. 02-Sep-1986. The float-equipped Otter had departed from Pickle Lake with a cargo of drill rods. While in cruise flight, the crew heard a loud 'pop' noise from the engine. Smoke flowed from the cowlings, followed by fire and a decrease in engine power. The pilot was unable to reach a suitable landing area and he force landed the aircraft in swampy scrub terrain. Both the pilot and passengers were able to escape before the aircraft was destroyed by fire. The engine reduction gear assembly had failed as the result of lack of lubrication. • C-FBER Removed from register. 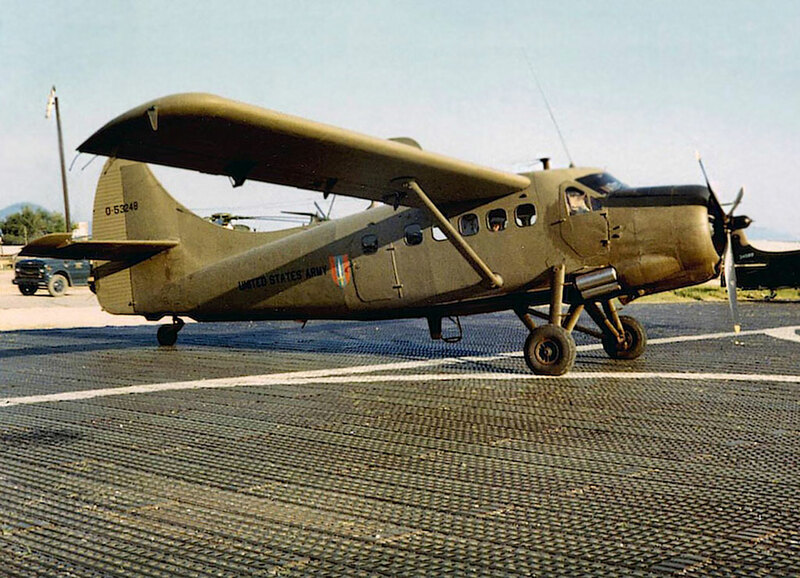 Otter 86 was delivered to the United States Army on 21 January 1956 with serial 55-3248 (tail number 53248). It was one of the batch of six Otters delivered that day to the 937th Engineer Company (Aviation) for use on the Inter American Geodetic Survey (IAGS), painted in a white colour scheme with bright red wingtips and tail. In “Operation Trade Wind”, all six Otters were delivered together. After leaving Downsview on 21 January, they flew south to Fort Belvoir, Virginia and then via Savannah, Georgia to Miami. They continued on to make a goodwill tour of the Caribbean and Central America, routing via Havana, Cuba – Cozumel, Mexico – Belize, British Honduras – Guatemala City – Managua, Nicaragua and San Jose, Costa Rica before arriving at Howard AFB., Panama, the 937th Engineer Company base. 53248 was then assigned to one of the IAGS Projects and by March 1960 was supporting a survey in Brazil. This survey was to establish gravity base stations at airports throughout Brazil, to relate gravity surveys to a common datum as part of a survey by the USAF’s 1370th Photo Mapping Wing. This survey was made in co-operation with the IAGS to fill in the gap in triangulation arcs between Venezuela and Brazil. The Otter departed from Howard AFB routing via Caracas, Venezuela – Georgetown, British Guiana – Paramaribo, Dutch Guinea – Cayenne, French Guiana – Belem, Brazil making gravity observations at airports along the way. The team spent three months in Brazil, flying all over this huge country in the Otter, which also received a 500 hour maintenance check at Rio de Janeiro. 53248 then retraced its steps back to Howard AFB., arriving late May 1960 to be greeted on arrival by an Army band. It had been the longest support project ever for a single-engine aircraft team operating on its own from the 937th Engineer Company. 53248 continued flying for the IAGS until April 1968 when it was one of six Otters withdrawn from the IAGS destined for service in Vietnam. It went first to the Sharpe Army Depot, Stockton, California for overhaul and repaint into olive drab and was then assigned to Intelligence & Security Command. When the overhaul was complete in November 1968 it was shipped from Stockton to Vietnam where it joined the 21st Signal Group, moving in March 1969 to the 2nd Signal Group. The following month, April 1969, it was put into storage with the 608th Transportation Company, Dong Ba Thin then in July 1969 with the 79th Transportation Company at Qui Nhon. From here it was shipped home, arriving at the Army Depot at Atlanta, Georgia in October 1969, where it was put into outside storage alongside several other Otters also returned from Vietnam. 53248 and these other Otters remained in storage at the Atlanta Depot until May 1972, when they were put up for disposal as military surplus. It was one of six Army Otters from the Atlanta Depot purchased by Air Craftsmen Ltd., of St.John, New Brunswick. This was a company which traded in Otters, buying military surplus aircraft, restoring them as civilian and selling them on. The six Otters were reserved as CF-BEO/BEP/BEQ/BER/BEU/BEW. These Otters were flown from Atlanta to St.John during October/November 1972, where they were rebuilt and civilianised. 53248 was registered to Air Craftsmen Ltd., as CF-BER. After rebuild CF-BER was sold in 1974 to Dolbeau Air Service Inc., of Chibougamau, Québec and in 1975 was in operation with Direquair Inc., also based at Chibougamau. The wheel/ski-equipped Otter was involved in a crash on 18 February 1975, landing on frozen Lac Chibougamau. The left wing struck the ground and the Otter crashed onto the ice and ended up on its side, with the left wing completely buried in the ice and the right wing pointing skyward. There was also damage to the tailplane, cowling and propeller. The Otter was repaired and in 1976 joined the fleet of A.Fecteau Transport Aérien (later Air Fecteau Ltée) of Senneterre, Québec. This company evolved into Propair Inc., to whom the Otter was registered in May 1982 as C-FBER. It was noted based at Senneterre in September 1982, all silver with a red cheatline and Propair titles. It continued to serve the Québec bush country for the next few years. It was involved in another incident at Natashquan, Québec on 24 February 1986. While cruising, engine vibration was experienced and the Otter made a precautionary landing on a bay. In April 1986 C-FBER was sold to Pickle Lake Air Service of Pickle Lake, Ontario to replace Otter CF-BEW (140) which had crashed the previous month. Pickle Lake Air Service was a subsidiary of Austin Airways / White River Air, which had been established to run the Pickle Lake base, and BER flew alongside Otter C-FODT (218). In May 1986 the Pickle Lake base and operation was sold to Frank Kelner, who formed Kelner Airways Ltd., trading as V. Kelner Airways but during 1986 operations continued using the name Pickle Lake Air Services. As well as Otters BER and ODT, a Beaver and single Cessnas were flown. In August 1986 BER suffered an engine fire on start up at the dock at Pickle Lake, resulting in an engine change but most unfortunately, on its first revenue flight with the new engine, on 2 September 1986, the Otter crashed and was destroyed. The float equipped Otter had departed from Pickle Lake with a cargo of drill rods. It was headed north to Opap, a strip serving a mine. While in cruise flight, the crew heard a loud ‘pop’ noise from the engine. Smoke flowed from the cowlings, followed by fire and a decrease in engine power. The pilot was unable to reach a suitable landing area and he force landed the aircraft in swampy scrub terrain near Wiebenville. Both the pilot and swamper were able to escape before the Otter was destroyed by fire. The engine reduction gear assembly had failed as a result of lack of lubrication. The registration C-FBER was cancelled on 17 May 1988. The mid to late 1980s were a very busy time in Northern Ontario due to a gold exploration boom. One company, Midwest Drilling, alone had some fifty drills turning year round in the Pickle Lake region. Kelner immediately bought Otter C-FDAK (157) from Green Airways to replace C-FBER.